April Fools’ Day…it’s always the same in the video game world. You are guaranteed to see plenty of ridiculous news stories that are just so obviously fake, but are still totally awesome. I think it’s pretty cool how everyone decides to do it, it’s become a tradition at this point. The obscure planet of Azeroth was found to harbor a dizzying selection of humans, mutants, and aliens in a state of perpetual superstition and conflict. The most physically imposing of these warrior races were the so-called ‘tauren,’ an anthropomorphic bovine genotype with super-human stamina, overpowered racial combat abilities, and bizarrely well-developed horticultural skills. While most tauren were satisfied with their agrarian culture and primitive existence, the Confederacy was able to lure away large numbers of young bulls for a life of adventure and violence along the galactic rim. Other tauren referred to these adventurers as ‘mad cows,’ and they were ostracized from the rest of their kine. The newly created tauren marines didn’t care–they got neat-looking armor and big guns to own everyone else with. These beefy new soldiers are now an integral part of the Confederate military, and have managed to horn in on the roles traditionally filled by firebats and other infantry units. You can see more videos of the cows in action here. They actually look pretty cool. I wonder if they’ll end up in the game, like the Pandaren did after they were a well received April Fools’ joke a few years back. Next we get the Bard, an all new class for the World of Warcraft – Wrath of the Lich King expansion. The class seems totally awesome and radical, I’d play as one for sure. 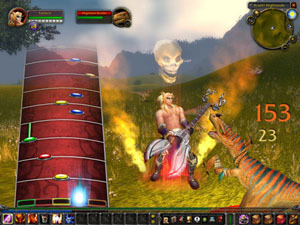 Armed with a trusty axe, killer riffs, and a ton of attitude, the guitar-wielding bard is the second hero class to be introduced in the upcoming Wrath of the Lich King expansion for World of Warcraft. The bard excels both as a solo performer and as part of a solid group lineup, able to front in a number of roles as varied as his musical repertoire. The bard’s extensive Metal skill line grants the potent transformational ability “I Am Murloc,” as well as direct damage effects like “Epic Solo” that will rock foes into oblivion while powerful Indie debuffs such as “Tape Jam” and “Shoegazer” keep them in check. If things heat up, the bard’s Punk tree can support the party with a wide range of abilities, such as “Nonconformity,” which dispels fear, mind control, and similar effects, or “Mosh Pit,” which briefly boosts the group’s movement speed while its members stay within range. Finally, Blizzard announces World of Warcraft is coming to a console. The Atari 2600. Blizzard’s World of Warcraft: The Molten Core Collector’s Edition, also announced today, will include tinted cellophane TV overlays, further increasing the array of colors available to players. Additional Collector’s Edition features, as well as details on the upcoming World of Warcraft: The Molten Core beta test, will be revealed closer to release. World of Warcraft: The Molten Core will initially be available for the Atari 2600 platform, with plans for additional console systems to be announced in the near future. In other April Fools’ Day news…Kotaku (Kaketaku) is just posting tons of video game themed cakes. And IGN announced a Zelda movie. April Fool’s day is totally awesome. And…Super Pii Pii Bros.
Pii Pii! Oh man. Now we girls can finally experience all that life has to offer.